We are thrilled to announce that we have expanded our Town & Country synthetic external shutter range by adding three brand new styles to the collection. Joining the six other styles currently available the new styles will add further choice and elegance to the range. The names of the new styles are ‘The Chevington’, ‘The Kilverstone’ and ‘The Croxton’. The Chevington is a modern and contemporary styled shutter with louvre blades recessed into the depth of the frame that are set in a diagonal position with air gaps between each blade. The Kilverstone is a ‘faux’ louvre style shutter. The louvre blades are recessed into the depth of the frame and set in a horizontal position with no gaps between each blade. The Croxton is a very similar style to the Kilverstone except there are air gaps in between each louvre blade..
We have been developing the designs over the past year taking inspiration from existing shutter styles and also taking into account the opinions of our customers. The result being three brand new innovative designs that are modern, contemporary and retain a classic edge. We are so excited to finally be able to unveil them to the public. The new styles were introduced to the already successful Town & Country synthetic range with the aim to deliver an even wider variety of styles available to our customers and to keep the range fresh and up to date with current and developing tastes. Town & Country synthetic shutters are our premium range being a bespoke, external, decorative shutter product. 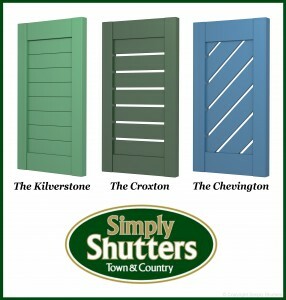 The range is handmade meaning shutters can be customised to specific customer requirements. Made from a blend of polymers replicating the weight, feel and look of timber but without actually being made from wood, no maintenance is required. It is a material we refer to as ‘synthetic wood’. As the Town & Country range is exclusively manufactured by us it is not available to purchase via any other source. Managing Co- Director Paul Millar says “We are delighted to introduce ‘The Croxton’, ‘The Chevington’ and ‘The Kilverstone’ to the Town & Country synthetic range. We aim to keep creating and developing new products as style and tastes change. It is with immense pleasure we finally get to unleash the new styles to our customers and are excited to see how the new designs are received”.